As we begin a new year I’m delighted to introduce an ongoing Photo Play opportunity that will encourage you to explore our monthly poetry themes in a visual way. I’ll be here to help you push your interpretation of the themes. This isn’t about camera techniques as much as it’s about “seeing”. We’ll work together (and play together) to develop how you see a subject and choose to photograph it. That can be as simple as where you stand and what you include in the frame, the most basic of all photography principles. To start, we’re looking at Doors and Passageways, which can make for interesting photos even taken in the most literal way. Walking through any town or village you’re likely to find interesting subjects. I’m hoping we also can take that a little bit further and look for a photo play on the potential of the new year, represented by openings or paths that give just a hint of what may lie beyond. – Do you want to get up close so you fill the frame with just the door – or a part of it? – Is there anything interesting around the door or opening, that you’d like to step back and include to help tell the story? – If you’re photographing a pathway, are there strong diagonal lines you can include to lead the viewer’s eye into the frame? – How can you use your angle of view to limit what’s visible in the distance or through the doorway? If you can’t decide between two possible approaches, shoot both and compare the images afterwards, thinking about what difference the composition makes to the mood of the photo. Post your “photo play” on your blog, Flickr, or Pinterest account, and leave the link in a comment on this post. Some photos will be chosen for feature at Tweetspeak Poetry and all will be posted on our Pinterest Photo Play board. Deadline for submissions is this Thursday. See you back here soon! Photos and post by Julie Matkin. 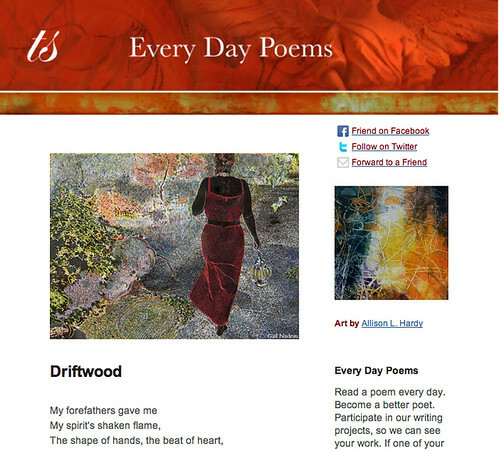 Sometimes we feature your poems and photos in Every Day Poems if they’re a good fit. Thanks for playing with words and photos! Thousands of times, my hand turned that knob. The room on the other side of the doorway knew all my secrets, and it heard about every dream — and the dreams of how many girls before me? And I wonder if we all slammed the door shut, hard against a mad world … or if the others let it creak shut on old hinges. Empty. But the memories full. Oh joy. Expectant here. Good things in store for this I know. I am slipping off to create an offering. Ohhweee. I’m thrilled – not just for the opportunity to submit an image, but to get feedback and insight. And these doors. Country doors. Even one with orange twine. I feel welcome. The Third Floor, childhood home. This is the passageway to my best childhood fun, … and my worst recurring nightmare. I took the steps, two by two, to play after school with my Holly Hobbie dollhouse up on the “third floor.” But in the nightmare, I can’t descend the steps, because three creepy old ladies are blocking the door. I’m 41 years old now, and still have that nightmare. And in the dream, I’m six, with a Holly Hobbie doll in my hand. miss jdl – that image is all kinds of awesome. Mom and daughter, in the barn door. They worked out their differences, and are on speaking terms again. But I can’t — for the life of me — figure out what they’re saying. Thanks! Can someone teach me how to indent lines successfully? I thought the indentation was by design. Love this. Love the format just the way it is. And the words are triumphant. Are not stacked up neat or placed in winding rows. Each one invisible to the human eye. Across the street from my house. The 4-wheelers in ATVs ignored the sign and kept going up, ruining the neighborhood favorite trail, so a neighbor built the fence. Forgot to mention, thanks for the learning questions, especially the one about strong diagonal lines! There’s been this nudging…and now I realize it was really the sound of a door opening and an invitation being offered. Here’s one I took a while back of an old, one room school house near where I live. Apparently, that was still a thing up until the 1970’s in some rural areas. Cool shot — are those the original colors? Really like it. Thanks! The yellow was drawn out with filtering, but the red finish from the door is original. It’s so fantastic to explore these words and images with you all – so many different perspectives! as the door of winter opened. What is the swing of a door? How is it made, in time or space? that joined the mountains to a hand. to something wild and holy. in a wilderness once blessed. controlled inside the wonder of this. Love these. I especially like that rusty door, and I really, really want to go inside Mango Bay–and the ice cream shop. How they cry out in pain. as they hear the wrecking ball. Tears spilled down like rain. Earth shook from all the pain.